It was 40 years ago that an artist named David Bowie released a single called “Space Oddity,” which became his breakthrough single. Recorded in the same year of the historic moon landing, the song, whose lyrics evoke the loneliness of being in space, has since become somewhat of a signature work for the artist. And while the rest of the album of which the song appears on may not be distinguishable from Bowie’s best works, it does, however, offer some flickers of the genius to come. Most of the tracks on Space Oddity are very folkish in nature such as “Unwashed and Somewhat Slightly Dazed” and the lovely ballad “Letter to Hermione,” about a former lover. 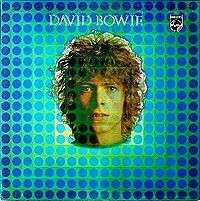 There are also some of the ambitious songs that arguably are precursors to Bowie’s later adventurous work such as the 9-minute protest song “Cygnet Committee” and the orchestral “Wild Eyed Boy From Freecloud.” The record ends on a unifying note with the catchy “Memory of a Free Festival.” But clearly the best song on this album is the title track, which it is still haunting and profound after four decades. This special anniversary edition also contains a bonus disc of tracks including a demo of “Space Oddity,” single (and glammed-up) versions of “Memory of a Free Festival,” and an Italian version of “Space Oddity,” albeit with different lyrics.